Featuring new cabs and greater lift capacity, JCB has been busy re-developing its range of Agri-spec Loadall telehandlers. Alex Heath reports. A new cab has made a huge difference to JCB’s Agri Loadall models. 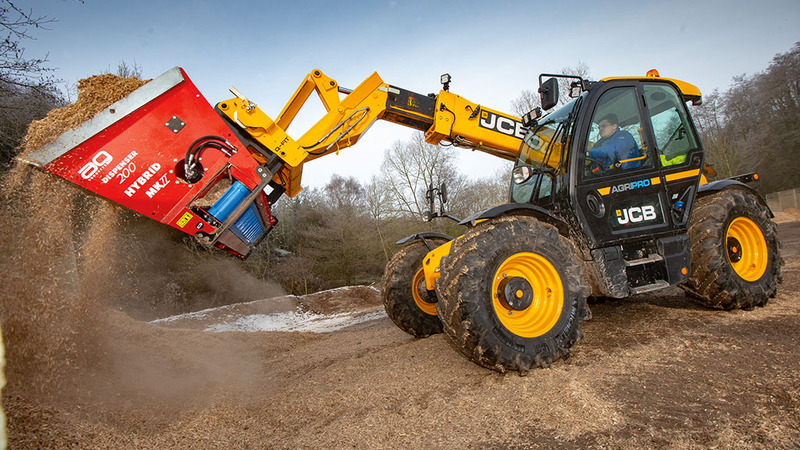 Having made done with its existing cab for over a decade, with few changes in that time, JCB recently revealed its Series 3 Loadall telehandlers, with the addition of the all new Command Plus cab. The Staffordshire firm is on target to produce its 250,000th Loadall this year, 42 years since it started producing the iconic loader in 1977. In that time, the concept of material handlers on farms has been refined to produce the latest iterations of the Agri-branded loaders. Previewed at the Lamma show in January, they receiving a warm welcome from prospective customers, according to the company. Featuring modest increases in lift capacity between 100-200kg, the new range is currently made up of four models (see panel), available in AgriPlus, AgriSuper and AgriPro specifications. The company’s 560-80 does not receive the changes. AgriPro models benefit from the company’s DualTech VT transmission, an amalgamation of hydrostatic for handling work up to 19kph and powershift for road work up to its top speed of 40kph. Engines remain unchanged from the preceding models, using JCB’s own EcoMax 4.4l and 4.8l units. The company says the choice of transmission dictate the engine options, which range in power from 75 to 145hp. Only the smallest 538-60 model can be fitted with the lowest powered engine. 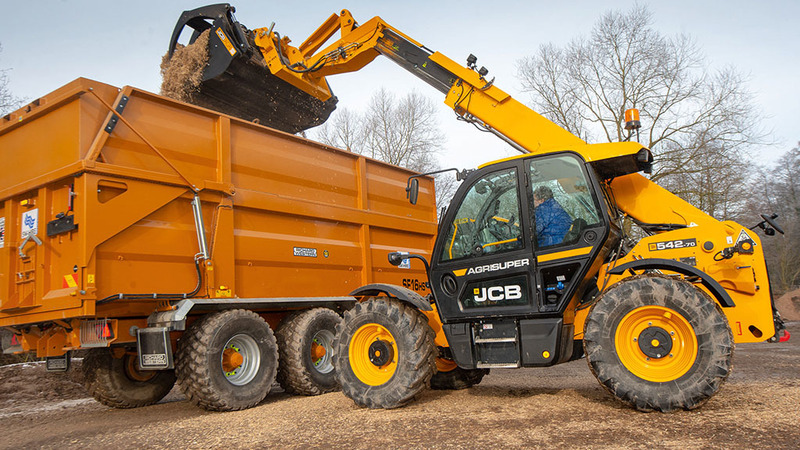 The company says £8 million has been invested in creating the new telehandler range; £6 million of which was dedicated to the design of the new cab. On top of this, extensive testing has been conducted, clocking up 50,000 machine hours, stress testing the range, as well as 10,000 man hours’ worth of tests in the seat. The headline feature of the range is its new cab, however, to accommodate it the company says subtle changes to the chassis and its geometry were needed. While no extra steel has been added to the chassis, focus on stress points, namely the boom pivot point has seen extra heft transposed to the area. As is often the case with a big reveal, a big list of percentages is also touted. This list associated with the Command Plus cab and its ancillaries is no exception. Cab size has increased by 12 per cent, in cab noise has been reduced by 50 per cent, there is 60 per cent more storage space and 66 per cent faster clearance of ice and condensation from the windscreen. However, the company also stress the most minute details of the machine have been meticulously considered for operator comfort and convenience. This extends from the stitching on the seat for durability, to the bolstering for posterior support, to the layout of the fuse relay box. 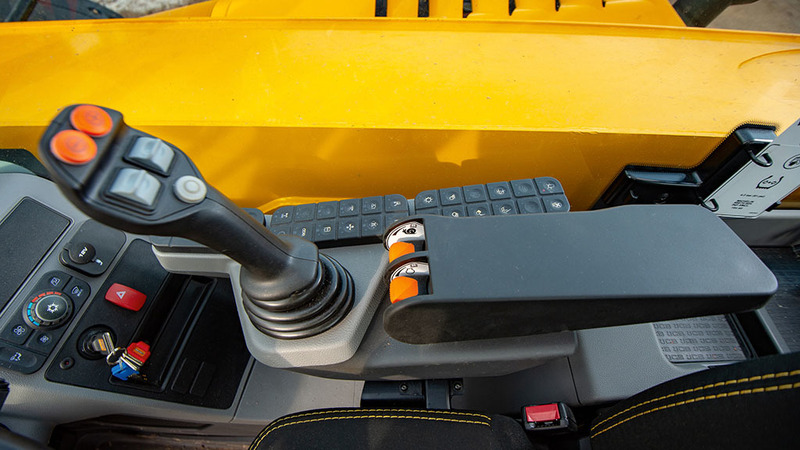 Both the width and length of the cab have been increased for operator comfort. Width has been increased by 35mm while the cab is 145mm longer than the previous design. Its actual footprint on the machine is only marginally bigger, due to the washer fluid vessel being removed from the front of the cab and relocated into the fuel tank and chassis. This means the steering console is larger, resulting in the operator being sat further back from the windscreen which is now a single pane of multi-radius glass, contorted in different ways to give a spacious feeling with good visibility, which is said to have increased by 14 per cent. Keeping the windscreen unsoiled are four wiper blades, giving a 92 per cent coverage. 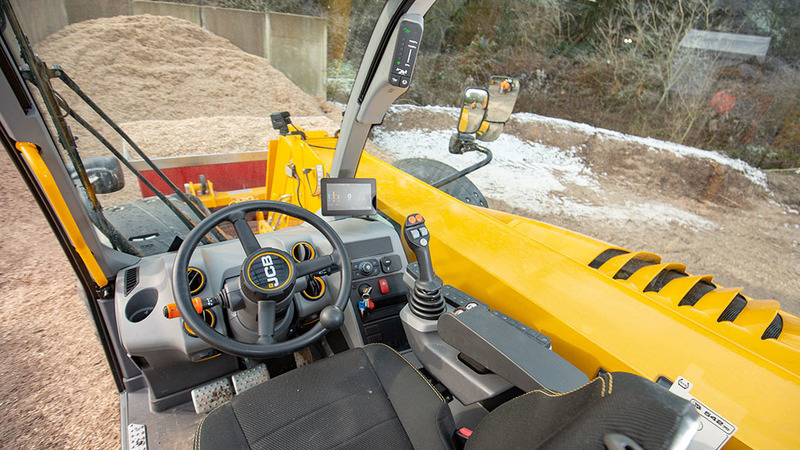 In-cab hardware has been influenced by the company’s tractor and wheeled loader ranges, sharing elements such as the Dynamic Tilt Away steering column providing unhindered access and the soft touch function buttons, grouped onto the seat-mounted armrest. The cab climate system layout is also in-line with the company’s wheeled loader range and features 10 per cent more airflow volume. The cab runs at a positive pressure, which sees the ventilation system’s recirculation valve open when the cab door is opened/shut. This ensures the door shuts easily, providing a good seal and prevents ear drums from becoming macerated as the pressure suddenly increases. A seven-inch screen is coupled to a rotary dial on the armrest and is used for selection of functions and machine setup. The company says the screen has a large amount of computing power, opening the possibility for extra work modes to be added, something other manufacturers’ machines are now using. At the rear of the machine, there is the option to add a pickup hitch. The hydraulic hitch will lift two tonnes, but has the capacity to tow 32 tonnes. Twin line hydraulic brakes and an EBS plug are standard. Air brakes are expected to be an option by the middle of this year. As you climb into the cab, the first thing you notice is how wide the door way is. Unlike previous Loadall cabs, there is no need to frenetically swing into the cab to avoid the A-pillar, as this is now well away from your head. The right hand grab rail then folds away, preventing any painful incidents as your elbow catches it, a common problem with the outgoing model. Sitting in the seat you get a sense of plenty space around you - no longer is it a cramped and noisy experience driving the telehandler. The seat is supportive and comfortable, air suspended to iron out any bumps. Adjusting the steering column is easy, and when pushed out of the way, remembers its last setting. The seat-mounted joystick and button clusters fall to hand easily. Buttons are backlit, a useful feature as identifying their symbols can be a struggle without the lights on. 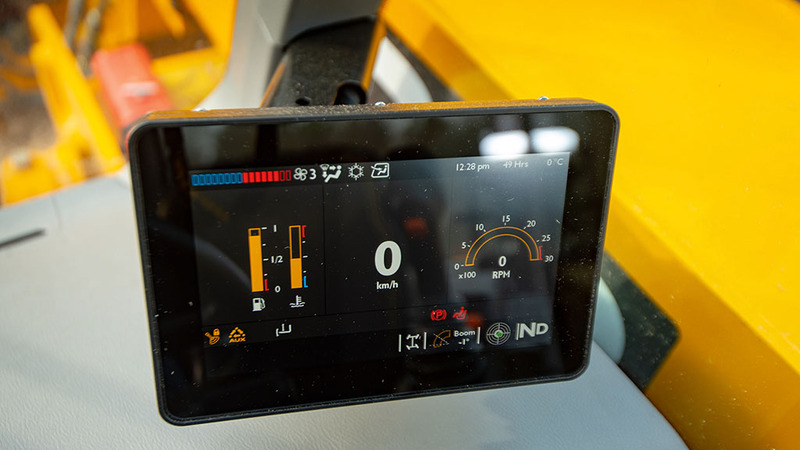 The screen provides all manner of information, from speed and engine temperature, to fuel levels and climate settings, to outside temperature and drive modes. It is intuitive to navigate when changing settings, and allows you to make the most of the clever DualTech VT transmission in the AgriPro models. Forward visibility is impeccable, but vision is still obscured when looking over the rear right wheel. The bulky mirror assemblage on the right hand side has been brought into the profile of the machine and goes a long way to rectifying the views rearwards. Behind the seat is a cavernous space, with enough room for a big lunch box, files and all manner of other bits needed for a days work. JCB say storage space has been increased by 60 per cent. The company says the cab is the industry’s quietest. We found operation to be hush quiet, with only a distant murmur from the engine. Overall, the Series 3 cab on the Agri range of Loadalls is a massive step forward in terms of comfort and refinement. The company says it has taken design cues and features from the automotive industry, and this certainly shows in the layout and over all finish.